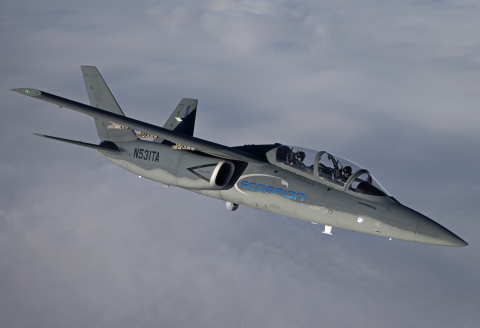 Textron AirLand, LLC, a Textron Inc. (NYSE:TXT) company, today announced that the Scorpion is now en route from Wichita, Kansas to France and The United Kingdom, for exhibition at two of the world’s premier defense aviation exhibitions. Scorpion will participate in The International Paris Air Show from June 15 to 18, followed by Royal International Air Tattoo in Fairford, UK, from July 17 to 19. Scorpion will be the guest of multiple European air forces and will fly demonstrations between the air shows. With its arrival in Europe, Scorpion will have completed three trans-Atlantic flights and flown numerous demonstrations in the U.S., Europe and Latin America. “We introduced Scorpion to the world at the Royal International Air Tattoo and Farnborough International Air Show last summer,” said Bill Anderson, president of Textron AirLand. “Since then we have completed a full year of flight testing, meeting and exceeding all performance targets,” he added. With over 385 flight hours and a readiness rating of over 95 percent, Scorpion has accumulated significant accomplishments in the 17 months since first flight. Achieved its top speed of 450 KTAS, reached its service ceiling of 45,000 feet and validated its operating cost of less than $3,000 per flight hour. In June 2014, Scorpion completed its first trans-Atlantic roundtrip flight covering over 9,200 nautical miles in a total of 38 hours flight time. Scorpion’s first military exercise was Operation Vigilant Guard 2014, a large-scale, multi-state disaster response exercise sponsored by U.S. Northern Command and the National Guard Bureau. It provided aerial reconnaissance, transmission of real-time full motion video and communications in support of other aircraft, ground stations and other emergency responders reacting to mock threat scenarios- “mission accomplished” without missing a sortie. Scorpion successfully intercepted a low slow flying threat aircraft below 100 KTAS demonstrating its suitability for the Low Slow Threat Aircraft Intercept Requirement as outlined in the NORAD Operation Noble Eagle Defense of North America mission. The United States Air Force Test Pilot School (USAF TPS) recently evaluated the Scorpion aircraft as part of Class 14B students’ “Capstone” exercise and to determine suitability as a T-38 replacement for the TPS curriculum. USAF TPS flew the aircraft for four days, achieving 100% mission availability and 100% mission accomplishment. During the four days, Scorpion completed nearly 20 flight hours on 12 flights (For perspective, most US tactical jets fly 20 to 25 hours per month). Every sortie was completed as scheduled (12 for 12) with one aircraft. The average maintenance turnaround time from Scorpion landing to “released for flight” was 38 minutes- the best turn was 15 minutes. Scorpion will be on static display in its armed configuration, along with advanced multi-spectral sensors and cameras for ISR missions. Weapon systems on display will include Raytheon Griffin Missiles, Lockheed Martin Hellfire and JAGM, FN Herstal 50 cal gun, Raytheon Enhanced Paveway 4, MBDA Brimstone Missile and Textron Systems G-CLAW. Scorpion will be joined by Beechcraft’s AT-6 Wolverine, Cessna’s Grand Caravan EX and Beechcraft’s Baron G58 ISR, all part of Textron Aviation’s product portfolio designed for special missions. Scorpion is a multi-mission aircraft designed with diverse capabilities including intelligence, surveillance and reconnaissance, humanitarian assistance, disaster relief, training and precision strike. Aircraft features include twin-engine power, two-seat operation, large internal payload capacity, high-definition ISR cameras, wing-mounted weapons stations, modern avionics, all-composite structure and more. For a closer look at the Scorpion, its mission capabilities and innovation timeline please visit www.ScorpionJet.com. Downloadable images and videos are available in the Scorpion Media Gallery. To schedule your interview, please contact David Sylvestre by cell phone at +1 401-640-6719 or dsylvestre@textron.com. Photographs and video are permitted. Background material and high-resolution images to support your coverage can be found on www.ScorpionJet.com and in the site’s Media Gallery.